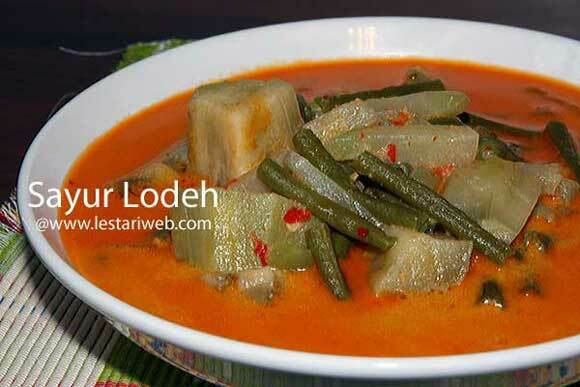 There are many different recipes of Sayur Lodeh. Each is special and unique!!!. I have lernt this recipe from my mother and continue to practice because for me it tastes best :-). 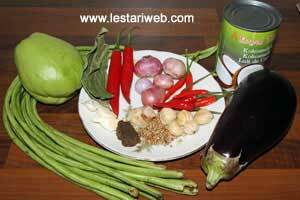 If you a kind of chilli fan and do not mind with the smell of shrimp paste, I will recommend you to try this typical javanese dish. Tips : cut the yard long bean by breaking it with hand instead of using a knife to obtain the best result. Wash the long yard bean and quickly set aside to drain. Do not keep aside in water too long otherwise it will absorb too much water and hard to cook. In contrary you can leave the peeled aubergine / eggplant in a slightly salted water to prevent the colour changing ( turn to brown). 1 Cut the chayote in half, slice thinly about 3 cm long. Put in a bowl. 2 Mix with 1 tbsp salt and squeeze to get it's juice out and elastic texture. Wash and set to drain. 3 Cut the long beans by breaking it with hand into 3 cm lengths. 4 Peel off the aubergine and cut into cubes about 3 cm on a side, keep in a slightly salted water. 5Put all ingredients for the paste in a blender or food processor and blend until smooth. (If necessery add a little bit oil to help the blending process). 6 Heat 2 tbsp oil in a frying pan and stir fry the paste. Stirring all the time until fragrant. 7 Add the long bean and chayote. Stir to mix then transfer to a big saucepan. Pour in the water and bring to boil. By then the vegetable is almost cooked. 8 Add the aubergine / eggplant and coconut milk. Lower the heat to medium and simmer until the eggplant well cooked. 9 Stir occasionally to prevent the coconut milk getting burn or separating. 10 Add salt and sugar to taste. Serve with rice and other accompaniments for example Fried Tempe or Tahu.